At this year’s OzAsia festival, Wifey and I were lucky enough to go and see JUMP, a martial arts comedy show from Korea that’s been doing the rounds internationally. We went into this one blind purely running off the official press release on the website because it sounded quirky and interesting. Turns out our impressions were pretty accurate! The story’s simple and stereotypical – the story is set around a Korean family (Father, Mother, Uncle and Daughter) who train diligently in martials arts as directed by their grandfather. There’s also the son-in-law, who the grandfather’s actively trying to setup with his granddaughter. Part one deals with the daily training regime, part two deals with the “incident” – a couple of guys decide to break into the household, and combat ensues. The show finishes with a run of acrobatics and martial arts, while the scenes are broken up with the great-gandfather offering some comic relief. The concept itself seems a little staid, and that’ll probably bother some. However, there lies a certain genius in the way the show has been put together. Given the language barrier, the show relies on physical comedy and over-the-top exclamations to communicate with foreign audiences. This presents challenges, but great opportunities as well. There are wonderful pop-cultural overflows with the use of English quips and more than a few tips of the hat to martial arts flicks of years gone by – I’m particularly reminded of a lot of the physical comedy present in movies from the Shaw Brothers and some from Golden Harvest from the 70s and early 80s. There are also tips of the hat that echo animation and hollywood flicks, some of which are subtle or possibly unintentional, and others not-so (such as the amusing interpretation of the 360° camera work from The Matrix). 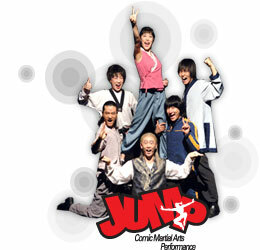 JUMP’s strength is in its physical action rather than its originality, but the execuction and sense of humour adds depth and makes it stronger for the sum of its parts. If it happens to come back again, I might have to see if we can drag a few more people along to the show, as I reckon my brothers, mates and fellow students would probably enjoy it as well 🙂 Highly recommended.